Global Supply Line’s main quality policy is to satisfy the needs and specified requirements of our clients. To achieve this objective GSL has implemented and maintains an updated Quality Assurance System based on the AS/ISO 9001:2008 standard, which is documented in our Quality Manual. Global Supply Line’s Quality Assurance Manager/Engineering Manager is an accredited Internal QMS Auditor. Also our Quality Consultant CPK Quality Assurance is permanently engaged in an ongoing contract and is a fully Accredited independent advisor. Global Supply Line (GSL) management, aware of it’s responsibility, ensures that our quality policy is understood, implemented and maintained at all levels of the organisation. As part of our ISO 9001 certified quality system program, GSL is focused on continual improvement of the company utilising fixed targets and goals, measuring improvements and analysing progress in relation to all facets of business operations as well as occupational health and safety issues. 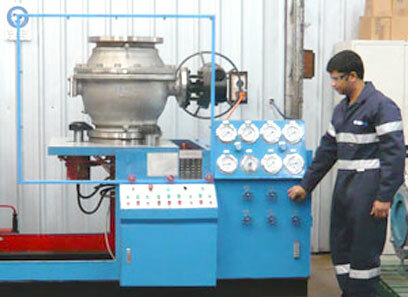 Stockist and indentor of valves, flanges, fittings and related pipeline components. Our pre-vetted approved manufacturers provide assurance of quality which is further enhanced by our supply chain risk capability. Approved by and servicing all major participants in the oil, gas, mining and power generation sectors throughout Australia and most of the southern hemisphere. is third party audited by Lloyds under our ISO 9001 management system. through Workcover Corporation and CGU Insurance. specifically in accordance with AS 4801 (OHS AS 18001). Advice – Brecknock Insurance Brokers Pty. Ltd.
Certification is supplied in accordance with EN10204.3.1 (DIN 50049.3.1) on all products supplied. Global Supply Line specialises in providing full service packs on your orders. 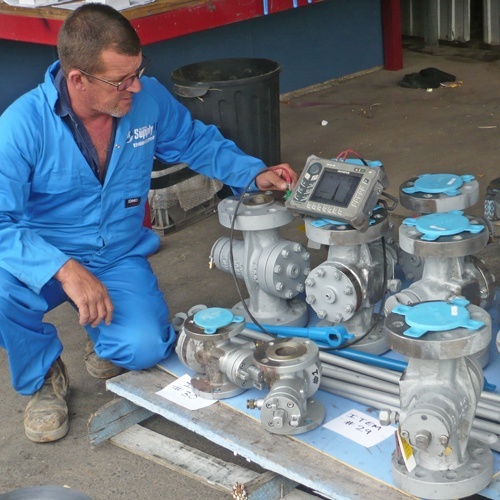 The above activities usually require the use of special tools, equipment and qualified personnel normally provided by the manufacturer or by external qualified laboratories. Upon request Global Supply Line can employ the services of independent and qualified institutes and laboratories to perform the inspection activities “on-site” or in neutral facilities. These survey and surveillance activities depend on collaboration with the manufacturer of the products to be supplied to Global Supply Line. For any of your orders, Global Supply Line can perform or arrange, with strict attention to detail, the following activities. All activities are kept under full control of professional, specialist staff. When required, all the above activities are recorded by Global Supply Line and duly reported to its clients with written and photographic reports. The above services, usually agreed upon at the time of order, ensures the client that the quality of the product is assured at a fixed price, preventing delays in delivery that may be caused by late detection of any non-conformity. 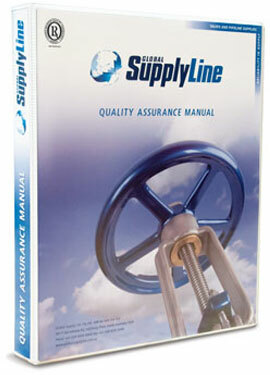 Global Supply Line selects its suppliers based on quality, liability and servicing. 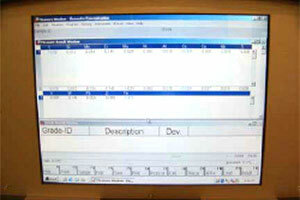 Complete original factory test reports are supplied for all products in accordance with DIN EN10204.3.1 (50049.3.1). 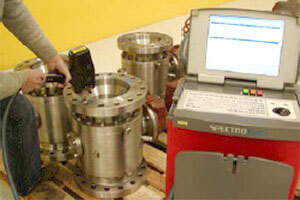 All material test reports are permanently maintained and always available through our MTR software. In addition to standard material testing performed at the manufacturing level, we maintain an advanced X-ray analyser providing the in-house ability to issue certificates of chemistry which increases customer confidence and allows for a high level of quality control. 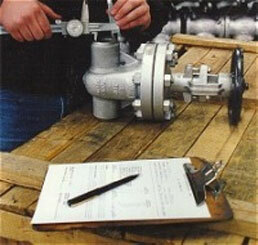 Global Supply line offer positive material identification if required for a small surcharge and with no delay. We have non destructive metallurgical X-ray testing capability for the following chemical elements : A105, WCB, LCB, LF2, LCC, WCC, CF8, CF8M, F51, F53, A20 and Monel. All product is supplied with factory 50049 3.1 certificate, however should you require additional assurance that the body, bonnet, wedge/disc/ball and stem meets the required material specifications, in-house PMI testing can be done using the latest Bruker (S1 Sorter) testing device.